Several years ago, a handful of friends seeking a healthier alternative to their social life in Dubai started meeting weeknights on the softball fields of the Metropolitan Hotel. Batting a ball around, getting a little cardiovascular workout and meeting new friends in a friendly social environment bolstered the lives of the informal group in a city where organised amateur sport leagues were relatively uncommon in the autumn of 2007. In a short time, 30 friends had joined an informal Facebook group to plan their on- and off-field get-togethers as well as stay in touch socially. 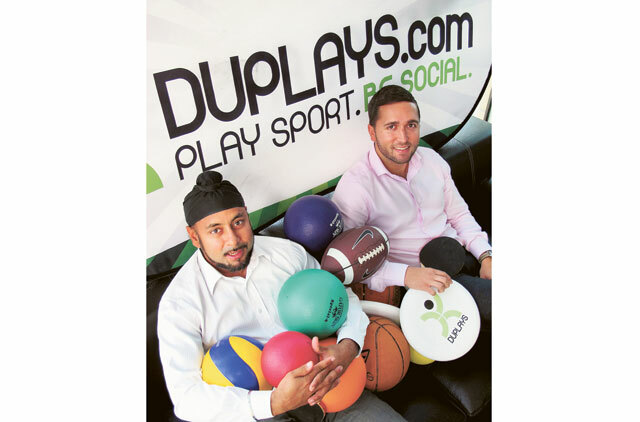 Three years later, from small and humble beginnings, the idea has grown into a new sports leagues business dubbed Duplays, an acronym for Do U want to Play Sports. And according to the firm, Duplays now has over 20,000 members. Calling itself the largest provider of sports leagues in the UAE, the Jumeirah Lakes Tower based company has skyrocketed in popularity. "Men and women of all backgrounds and job titles from secretaries to CEOs come together through the camaraderie of sport. Duplays' leagues regularly have 30-plus nationalities sharing the court, pitch, sand of field," the company says on its website, a touchstone for all seeking sporting and social contact. The firm said the website has morphed into "the single point of contact for all sport registration, communication, scheduling and new sport opportunities in the UAE." A quick visit to the 14th floor offices of Duplays in JLT reveals a business environment as fresh and as active as the company's central nervous system, a website chocked full of sports league games scheduled across the UAE in Dubai, Abu Dhabi and Al Ain. Soccer balls, basketballs, Frisbees and giant Duplays banners punctuate the office where Canadian founders Ravi Bhusari and Davinder "Derv" Rao work daily to build up the company. Bhusari holds a masters degree in engineering while Rao holds a masters degree in pharmacology. The company has reached a new critical mass of revenue only of late, enabling the firm to employ nine staff needed to oversee the wide geographical mandate of the company. Both founding partners still remember vividly working countless hours in the early start-up days of the company, rarely taking a paycheque to ensure that revenues were tilled back into the firm. The partners relied on lines of credit and personal savings to get through the first two-plus lean years of preparing the essential groundwork needed to launch Duplays as a growing successful Dubai business. With Dh1 million spent in capitalisation funds to get Duplays off the ground over three years, the hard work has paid off and the returns are beginning to materialise. Duplays is doubling in growth every year from 5,000 members in 2008, to 10,000 members in 2009, and to its current roster of 20,000. "We arrived at 20,000 members as of December 31, 2010 and our goal for 2011 is to double that to 40,000," Rao said. Rao said the hard work to start a company from scratch is paying off judging by the numbers. "We now have 50 sports leagues and 4,500 people play each week in 15 different sports," said Rao. "Our leagues are just starting up now for the year and they will run for 10-12 weeks." The large clientele list leads Rao to proclaim that Duplays is now "the UAE's only sport and social club." Bhusari said the only direction for the business to go is up given the high demand by amateur semi-professionals and professionals for organised sporting leagues in the UAE. "We're trying to organise sport for as many people as possible to allow the average person to get involved," Bhusari said. When he first arrived in Dubai in July 2006, Bhusari said he was perplexed by the lack of amateur sports leagues, especially given the size of the growing city. "I was dumbfounded that a sport and social club had not been founded here," he said, noting that Duplays is attempting to emulate highly successful sport and social clubs in big cities such as Toronto and Chicago. The reasonable annual cost is similar to joining sports clubs in other cities, he said, and has helped shore up the ranks as Duplays becomes entrenched in the Dubai business and sporting community. The cost per person ranges between Dh300-Dh500 which works out to anywhere from Dh35 to Dh50 per game. The relatively low yearly cost has helped grow Duplays in its infancy and at the same time that the world suffered a global economic crunch spurring on tighter budgetary restraints by individuals and corporations. "We've really been recession proof," said Bhusari. "We've managed to grow every year but it's been a tough market." Members not only receive good sporting value, he said, but also social value for the fees. With every game played, social circles and goodwill between sports minded professionals widen for players. "This is such a good social outlet to meet other people," Bhusari said. "It's a great networking opportunity as well." Rao said Duplays is preparing to introduce itself as a sports partner to hundreds of thousands of university students across the country. "The market is there in large numbers. Even if we just tap into a small portion of that, it would be incredible," he said. Demand by youth for organised sports in Dubai and beyond shows no signs of abating judging by the high degree of interest demonstrated recently for some of Duplays events. At the NBA Jam Fest on Yas Island late last year, Duplays Three-on-Three tourney drew 130 registered teams in five divisions. "We had to turn away 60 teams," said Rao because they could not be accommodated within the two-day schedule. On February 11, Rao said the company is expecting a repeat of high demand for Duplays Netball Tourney in which 50 teams will compete. Bhusari said the challenge for Duplays is to keep the company's daily offerings in a simple manageable form that can be expanded throughout the region. "We're trying to build a business model that is easily replicated," he said. "If you offer organised sport at a good price with good facilities, people will come." Hillary Lawson, 29, is a Duplays client who says mixing her love for sport and socialising has found a home in the sports company. When Lawson moved to Dubai two years ago, the financial analyst was like many expats and eager to meet others shortly after arriving. "When I moved here, I didn't know anyone," she said. Lawson discovered the Duplays website after a Google search and joined amateur volleyball and ultimate Frisbee leagues offered in Dubai. "I love sports to meet new people. It's the best way to meet likeminded people. There are new faces every year," said Lawson. Duplays is helping expats to bridge barriers by using sports as a touchstone for people from different cultures to meet and interact, she said. "Duplays is doing a very good job of organising sports. They're appealing to the many nationalities here," she said. "People are always looking for something new to do." Roxanne Brouille, 33, a real estate consultant, has been a member of Duplays since the early days of the company and values her weekly volleyball and Frisbee games. "There are all age groups, professions and nationalities," said Brouille. "The one thing we have in common is sports. Duplays has helped me feel a bit more well rounded because I have friends from many nationalities." Brouille looks forward to regular amateur games not only as a way to keep a body healthy, but to also stay in touch with new friends in a city that can be a very transient place. "I look forward to my weekly appointments with my friends," Brouille said. "I've made some really good friends, I'd say 20 or 30, from playing sports."